The PicoSure laser has revolutionized the way tattoo removal is performed. Up until recently, the gold standard for laser tattoo removal was the Q-switched laser. The Q-switched laser treats tattoos by heating up the tattoo pigmentation, but also by heating and potentially damaging the surrounding tissue. This often led to pain, scarring and many treatments. Maybe you’ve had laser tattoo removal treatments in the past with modest success. Consider coming in for the PicoSure, as we may be able to clean up that old lasered tattoo remnant. The PicoSure laser is the original picosecond laser created for aesthetic purposes. The way that it works is by using an ultra short pulse of energy (measured in trillionths of a second!) combined with targeted pressure. Instead of heating up the tattoo pigment, it uses pressure to shatter the ink into smaller particles which are then easily absorbed by the body. Therefore, results can be achieved using less energy, fewer treatments, and much less damage to the surrounding tissues. The PicoSure is effective at treating even stubborn tattoos, or ones with blue, green, or red inks that are difficult to clear with traditional tattoo removal lasers. To be sure, these pigments can still be tough to remove. Unlike some early PicoSure lasers, we also have the 532 handpiece which specifically targets red, orange and yellow pigment (some of the harder colors to eliminate). Before and After 3 PicoSure Treatments. 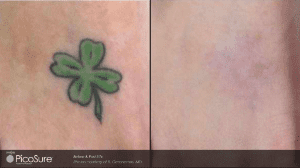 Yeah, this was a very lucky clover, most tattoos take several more treatments. The number of treatments necessary is dependent on a variety of factors, including your skin type, age of the tattoo, colors of the tattoo, and location on your body. Please schedule a consultation at our office to learn more about the number of sessions required for your specific tattoo. Treatments are spaced 4-6 weeks apart. You will be provided with a topical anesthetic cream as well as a Zimmer air cooling machine during the treatment, which blows cold air onto the skin, making the treatments more comfortable. Many patients say it feels like getting a tattoo, only much quicker. You can expect swelling, redness, and some soreness following the treatment. Occasionally the laser can cause a blister. Some blistering is normal and will resolve with time and some minor wound care. It is very important to keep the treatment area out of the sun for 4 weeks prior to your first session as well as in between sessions. Tattoo removal takes time and is not a miracle procedure – you may reach a point where improvements stop and you are left with some permanent remaining ink or discoloration. But being committed to sticking with the treatments, and coming regularly for your sessions will get you the best results. Call our Santa Barbara office or use our online booking tool to schedule a consultation for laser tattoo removal. A brief health history will be taken. We will note previous laser treatments, recent sun exposure, and any adverse events or skin reactions when you received your tattoo. Your tattoo will be evaluated for color, scarring, and effect from any previous removal treatments you may have had. A preliminary estimate of minimum number of treatments will be made. This may change as treatment effects are seen. Cost will be be determined based on size. If you are ready to proceed, the first PicoSure laser tattoo treatment will be done. Like with any laser procedure, we will provide you with eye protection. Air cooling, local anesthesia, or a numbing cream may be used to minimize discomfort. Depending on the size of the tattoo, the PicoSure laser procedure typically lasts under 10 minutes. A small tattoo can be lasered in under a minute! Treatments are typically every 4-6 weeks. We will tell you how long to wait between appointments based on the progress made and your skin type. Blisters and scabs can be a normal response to tattoo removal. Keep the skin over it covered with a healing ointment and gauze to promote healing and prevent scarring. Between treatments, be sure to keep the area out of the sun and covered. We will give you additional tips for care during your appointment. Depending on your skin and tattoo response on your initial session, we will likely increase the laser energy on your subsequent visits. You may not see much effect after the first couple laser tattoo sessions. There are still a lot of large pigment particles that need to be further broken down for the body to remove them. Be patient. You will need multiple sessions. Check out before & after photos here.